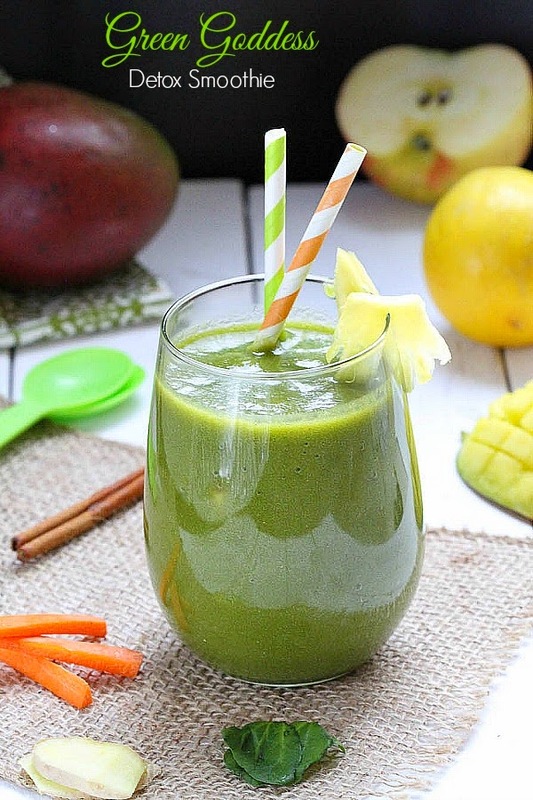 This delicious vegan non-dairy, sugar free green detox smoothie is loaded with spinach, kale and tons of fiber, antioxidants, and immune boosting nutrients for optimum health. Happy New Year everyone! Hope you all had a great holiday! We had fun visiting family and friends and it was so nice having the hubs at home all day for the week too. Did you guys have lots of sweets over the holidays? I was actually pretty good this year and didn’t go too overboard — even though I was really tempted to. Thankfully, I had people that were nice enough to help me take everything off my hands and out of the house. 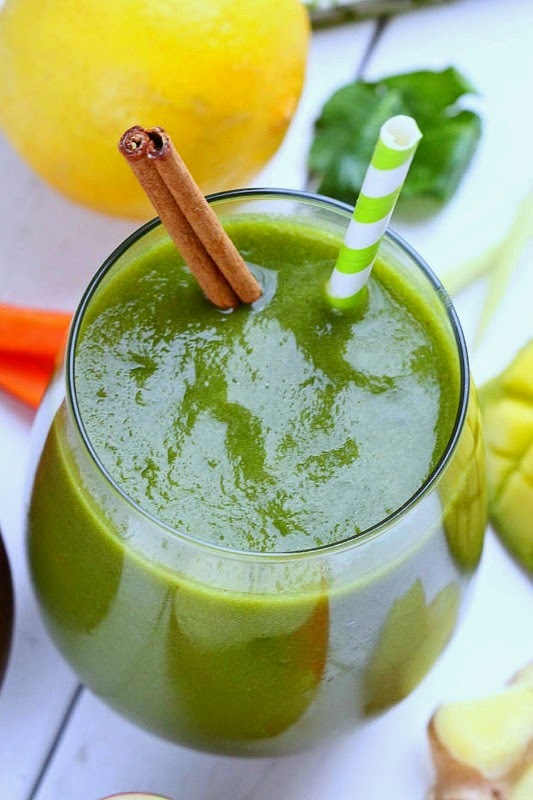 Even so, I always find that my body craves for that extra boost of greens right around this time of year so that’s when I turn to my green smoothies. And not just any old green smoothie like the #wonteatanythinggreen smoothies I make for my husband, mine are bright and green in color but still fruity and tasty! I swap out the ingredients depending on what I have on hand but when I really feel that I need a healthy boost, they are always dairy-free with no added sweeteners and jam packed with a ton of healthy veggies. 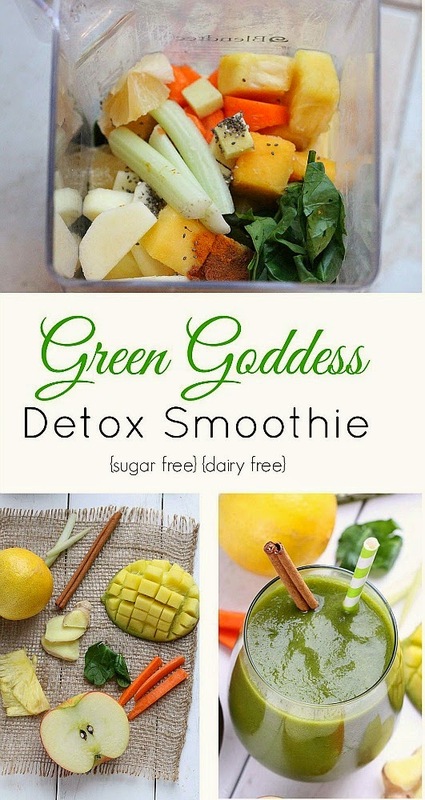 I know there are a ton of green smoothies out there and in case you are looking for more inspiration, this Green Goddess Detox Smoothie is refreshingly sweet, creamy and doesn’t taste like you are drinking any veggies. 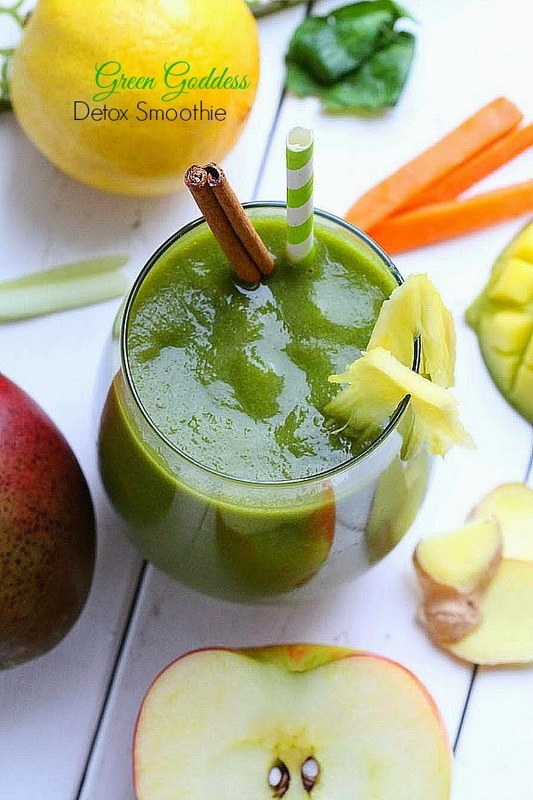 Even my three year old loves drinking this smoothie whenever I make it which says a lot since he’s not a fan of drinking anything green either. 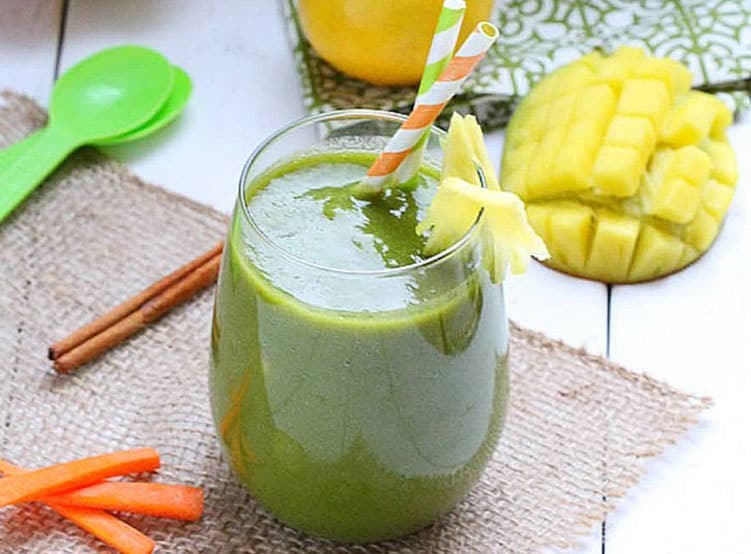 Thanks to the natural sweetness from the mango, pineapple, apple and carrots along with the refreshing zing from the lemon and ginger, it doesn’t taste like you are drinking all those greens. It’s also creamy and thick thanks to the frozen fruit and chia seeds. 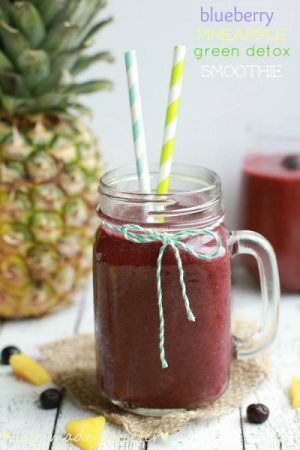 It’s jam packed with vitamins, phytonutrients, folic acid and protein to get you going throughout your day. I just toss everything into my Blendtec and can enjoy two glasses throughout the day. 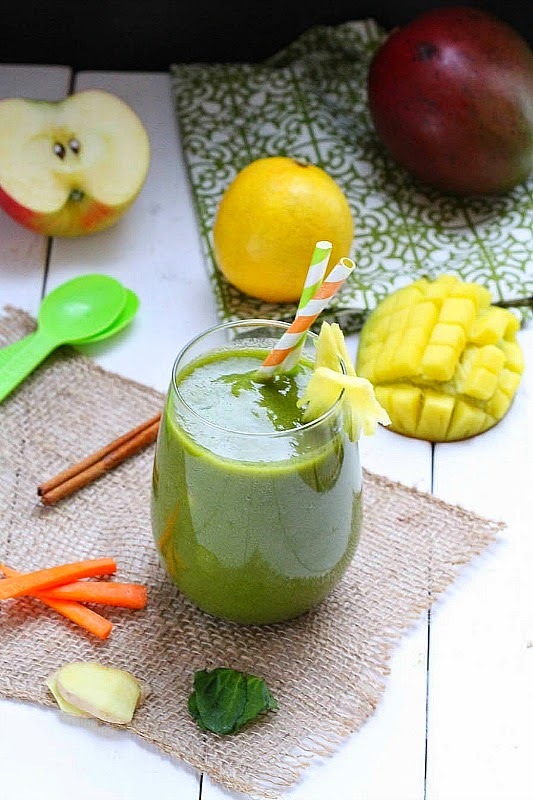 With two small kiddos that are full of energy, this smoothie gives me that healthy boost I need to take on a full day day of keeping up with them. Just one glass will leave you feeling refreshed with a big burst of energy and get your year started off on the right healthy track. Place all the ingredients in your high performance blender (I used the [url href="http://blendtec.com" target="_blank" rel=”nofollow”]Blendtec[/url]) in the order as they appear. *I use water kefir but coconut water or any water you have on hand will work. *I try not to add any type of sweeteners when I feel the need to detox but feel free to add a little bit of honey depending on your taste.